The 11pc Anchors Away baby bedding set by Sweet Jojo Designs creates a classic boutique setting for your little sailor. It uses crisp white cotton, navy blue accent trims, and features traditional anchor appliques. 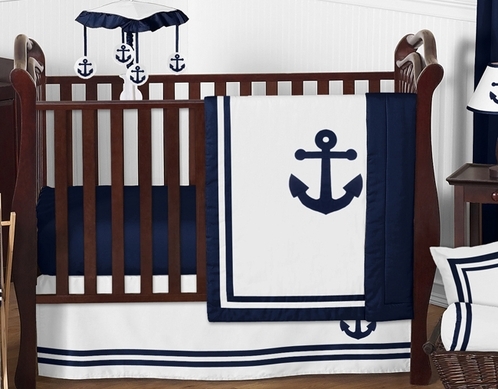 This Hotel inspired nautical themed designer crib bedding will set your nursery up in high style. This Sweet Jojo Designs set will fit all standard cribs and toddler beds and is machine washable for easy care and repeated use. The blanket is designed with white cotton and navy accent trims. It is adorned with a large anchor applique. The navy coordinating crib sheet is 100% cotton for ease, comfort, and repeated use. This Sweet Jojo Designs set comes with (2) rod pocket window valances. These valances are made with white cotton, navy trims, and an offset anchor applique. The crib skirt is also made using white cotton, navy accent trims, and an anchor applique. This decorative bolster pillow is made using crisp white cotton with navy trims. What a charming finish to this adorable set!